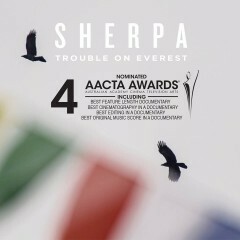 Exclusive Advance Screening of the Everest documentary "Sherpa". Q&A from triple Mount Everest summiter Duncan Chessell. Exclusive Advance Screening of the Everest documentary "Sherpa" and Q&A from triple Mount Everest summiter Duncan Chessell. "Sherpa" is a documentary that follows a 2014 Everest expedition entirely from the Sherpas' point of view. All profits from this evening will go to support the Himalayan Development Foundation Australia and their rebuilding 10 Villages Project.